Inside the cab is immaculate as you can see from the pictures. Approx 20ft Box with fully working tail lift. No Reserve. You will not be disappointed the way this truck drives. Windows on box. UK plate,1999, all dry inside, great overall condition, good engine. Mileage 168 000. A bargain. It is a 210hp 6 cylinder 6.2ltr engine with a 6 speed Eaton manual gearbox. The body is just over 9mtrs long. it has 3 double side loading doors on the N/S and 1 double side loading on the O/S at the rear. THE LORRY AS NO MOT IT AS BEEN PARKED UP FOR FEW MONTHS. 7.5T ISUZU NQR TILT AND SLIDE RECOVERY TRUCKS. THIS VEHICLE IS FITTED WITH A 21 FT ROGER DYSON TILT AND SLIDE BED AND HAD JUST HAD A NEW TURBO AT A COST OF £2600 PLUS RECENT MOT AND SERVICE. THE INTERIOR AND EXTERIOR IS ALL IN VERY GOOD WORKING ORDER, WE HAVE MANY RECEIPTS TO PROVE A LOT OF MONEY HAS BEEN SPENT ON REGULAR MAINTENANCE OF THIS TRUCK. ERF 1988 E SERIES COMPLETE WITH MONTRACON ACCOMMODATION BOX VAN TRAILER. AIR SUSPENSION BOGIE WITH REAR STEER, BOTH ON SUPER SINGLES PLUS ONE SPARE. INTERNAL DIVIDING WALLS HAVE BEEN FITTED ON A RAISED FLOOR TO ALLOW PLUMBING TO BE FITTED OUT OF SIGHT. 5/6 Horse, OR parking and garage for race circuit! Would make an ideal horse box, motor sport / transporter or to go for export. Lots of spare parts to go with the truck ! Got all the paper work, spare keys, etc. Runs really well, good engine, good gearbox, good axle, prop, etc. Double sleeper cab. Fully maintained and safety checked on a 6 weekly cycle. Over wheel strapping & curtains that open. Recently refurbished/ replaced rear shutter. 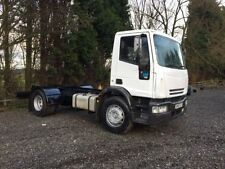 2006 (56) Mitsubishi Canter Fuso Cab / Chassis. 7.5 tonne. •Mot 30th Nov 2019. Circa 400k KM, double sleeper, 5 door, taillift, automatic, fridge in cab, Removals truck. 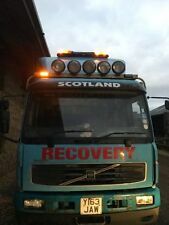 This is a high spec 2006 truck in constant use with usual body work nicks and scrapes but all sound and in daily use until sale. 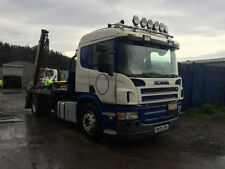 ALSO HAS GOT A SPECLIFT, VERY RARE BODY OF THIS SIZE, VERY CLEAN FOR THE AGE, BEARLY BEEN USED THIS TRUCK. THIS TRUCK CAN TAKE 3 LARGE CARS, OR 2 ANY SIZE OF 7.5 TONE. HIGH ROOF CAB, WITH GOOD WORKING ORDER NIGHT HEATING. DAF lf 55 220 13 ton 26ft box Manual air suspension tail lift. Finance available close Brothers asset. Nice clean wagon inside and out. Well maintained. Full service history. Been used for driver training. 59 plate daf lf 45, 300,000 mile on the clock. I bought this truck 8 months ago was planning on running it, but change my mind. Apart from the the couple of Marks around the cab the truck is sound. Bad think maybe requiring repaint body. 160000 MILES I AM STILL USING IT. YOU WILL NOT FIND A BETTER BEAVERTAIL ANYWHERE. for further information. Mitsubishi Fuso Canter 7C18 Recovery Truck. 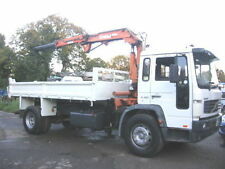 2006 MAN TGL 4X2 12 TONNE RIGID FLATBED. DOUBLE SLEEPER CAB. FOR VIEWINGS AND ENQUIRIES CALL PAUL ON. GREAT CONDITION FOR AGE. VEHICLE IS WELL MAINTAINED. SERVICED EVERY 6 WEEKS. GOOD TYRES ALL ROUND. 2011 Isuzu 7.5ton Skip loader and 16 skips. They comprise of the following. They are all clean straight and near new condition. The skip bed was sand blasted and painted prior to us purchasing the lorry early last year so is in very good condition. MAN 7.5 TON LORRY "NO VAT"
COLUMN TAIL LIFT. EXTENDABLE COUPLING. Brakes are good if a little sharp when empty but this is normal for an 814. fully fitted with hot and cold water over sink. Fitted wardrobe for riders clothing. split stable door into living. 3 overhead cupboards and 3 under seat lockers with pull out drawers (no need to lift the seats). Ideal for horsebox conversion. Would cut down for scaffolding wagon. Finance available close brothers asset. Runs and drives perfect. With Rare, Sought after body length. Ideal kept as current, or convert to flat / scaffolding. 750 HIAB SINGLE PUSH, ALL WORKS WELL, NO LEAKS. LIFTS ABOUT 2 TON. THE ROLLER BEARINGS ON THE HIAB LEGS NEED REPLACING. STILL PULL OUT OK AND WORK PERFECT. NICE CLEAN CONDITION. DRIVES LOVELY. LORRY IS IN ONGAR ESSEX. Six seater crew cab fitted with seat belts Manual gearbox six speed. Nice clean wagon inside and out. Well maintained 👍👍👍👍👍. Has an insulated body with tow bar. Great condition. excellent runner. We also have a 2010 model available. 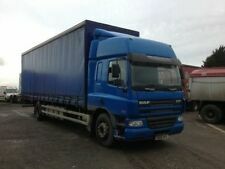 Daf 410 XF tractor unit, twin bunk sleeper cab, air con, cruise, fridge, etc. good tyres all round with approx 775kms, EU5 engine with no faults. 2008 double deck motorsport trailer, freshly painted and tested until the end of 2019. Ideal horsebox2013 63. Ideal for horsebox conversion. Well maintained runs in drives perfect. Finance available close Brothers asset. Tested till December 2019. Ready to work. 140,000 km. Nice clean wagon inside and out. Finance available close Brothers asset. MOT till November 2019. 2 car transport / recovery truck. Well looked after truck clean and tidy. Good tyres all round with Spare wheel. In all good working order with 2 hydraulic rams with lock pins. 2015 (65)Ford Transit 470 L4 2.2 TDCI 125ps TILT & SLIDE RECOVERY/TRANSPORTER! 1 FORD DEALER OWNER WITH FSH. POWERTEC BUILD FROM NEW! Iveco 75E15 horsebox rear ramp aluminium and rubber covered floor stalled for 3 horses seating area for 5/6 people with sink and hob cut though into tilt cab good tyres alround mot until November 19 great runner easy to drive. The mileage it might increase as the truck is still on use.